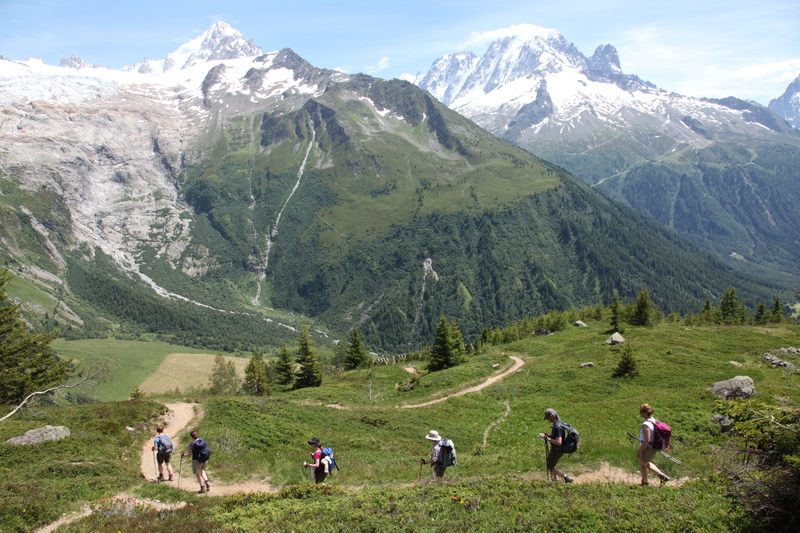 The Tour de Mont Blanc is one of the most popular long-distance walking routes in the world, traversing through France, Switzerland and Italy as it circumnavigates the immense Mont Blanc massif, the highest mountain in Europe. The full distance is usually walked in 10 days; due to work and time constraints we had decided from the outset to tackle the six most scenic and challenging days of this route, starting in Italy in Courmayer and finishing in Chamonix in France. Exercise MAROON HEIGHTS was the culmination of eighteen months of fitness training, kit testing and navigational practice. The members who had signed up back in winter 2013 were a mixture of experienced and novice walkers, but all of us had put in the personal and group commitment needed to ensure that we could tackle the challenge, and our frequent weekend expeditions staying in youth hostels up and down the UK had forged a supportive and comfortable team mentality. We were keen to put our skills, teamwork and kit to the test. Six months before the trek, the members were paired up, with each pair taking responsibility for one day of the expedition. This required planning meetings in advance to discuss the route and any potential difficulties we may encounter on our allocated leg. Our first day, described as the “perfect start” to the TMB, introduced us to the breath-stealing climbs, stunning mountain vistas, sharp descents and welcome refuges that would characterize the Italian segment of the route. 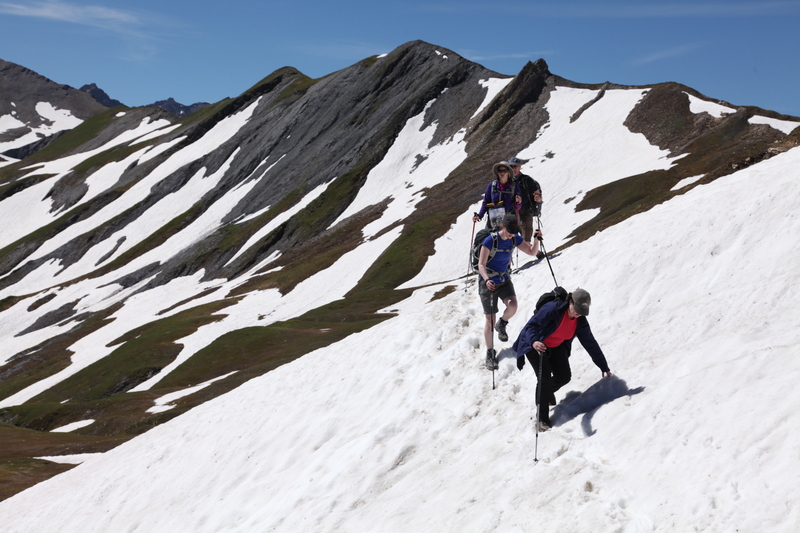 A punishing climb in the early morning set the pattern for the first two days, but we were rewarded on each occasion with undulating alpine meadows carpeted with wildflowers on the higher slopes of the Italian Val de Ferret. Each evening would be spent debriefing the day’s walk, before handing over to the next pair in order to brief in the following day: the route, anticipated terrain, weather forecast and any potential issues. It was obvious from the outset that teamwork was paramount to ensure a successful expedition. Climbing up to the magnificent Grand Col Ferret on day two (the border between Italy and Switzerland), we were lucky to see both marmots and ibex; the beautiful 30 degree temperatures providing perfect visibility of the massif and glaciers as an appropriate backdrop. 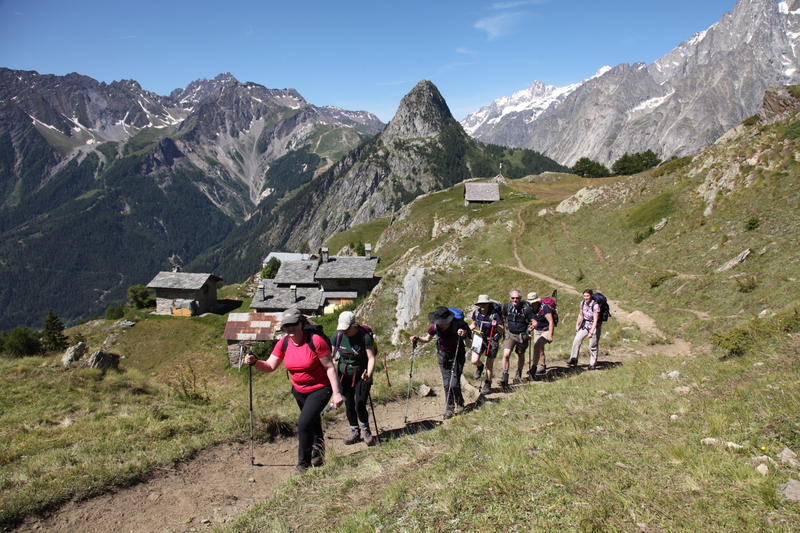 Days three and four, the Swiss section of the TMB, were expected to provide a slightly gentler route, passing through the Swiss Val de Ferret and past the Rhone Valley up onto the Col de Forclaz. We passed through picturesque Alpine villages, climbed through thick pine woods and forded milky mountain streams; often to a melodious background of chiming cow bells. Muscle memory was kicking in which made the going just that little bit easier, but the lower wooded altitudes posed their own problems, with oppressive humidity, track diversions requiring careful navigation, and, very sadly, the resurgence of one member’s knee injury, which kept her out of action and hobbling for days four and five. The final two days of walking took us back to the heights as we crossed into France and got our first glimpse of the Chamonix Valley. As at every point throughout the trek, the views were absolutely spectacular. 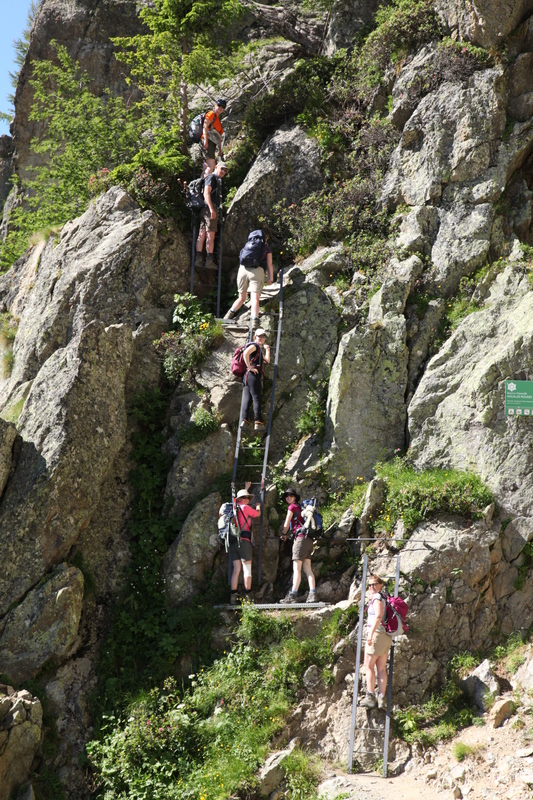 Perfect photo opportunities came on the final day between Argentiere and Chamonix when the group was forced to tackle the infamous TMB ladders. These precarious metal handholds (14 ladders in total) have been placed into the sheer rock faces as a means of accomplishing height gain quickly, and were not for the vertigo-inclined. 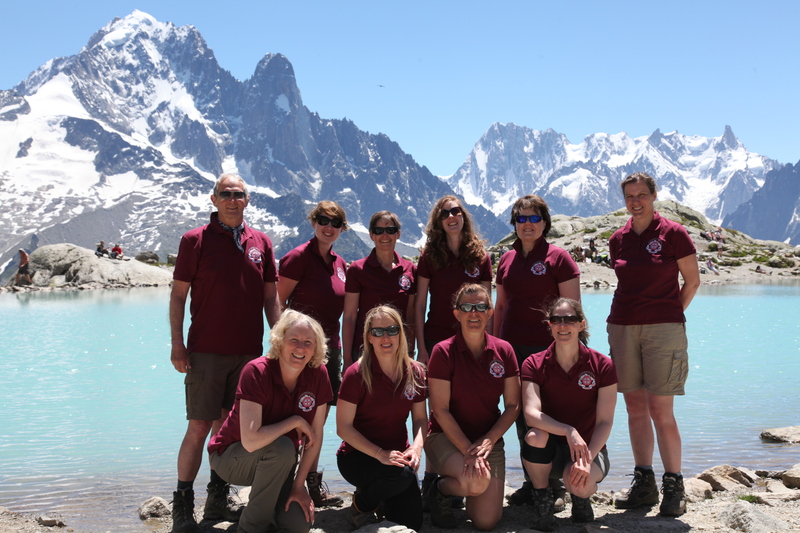 Nevertheless, the group tackled the challenge with gusto, celebrating their triumph at the beautiful Lac Blanc. This celebratory atmosphere was sobered on our descent as we watched an injured woman rescued off the mountain by helicopter. But the spectacular flying abilities of the French Gendarmerie reassured us that, had we not been so lucky in our relatively-injury free expedition, we would have been in excellent hands. Our final night was bittersweet as many of us had found our legs becoming more and more invigorated with every day, and we were ready to complete the remainder of the route! We had been hugely fortunate in the weather and the scenery. But our own training, mutual support and commitment had also played a key role, and ensured that our group were prepared mentally and physically for the expedition. All came out of the experience with renewed confidence in their walking skills and their personal ability to rise to a challenge, as well as a lot of enthusiasm for a successor expedition. Many thanks to the Ulysses Trust for their support towards the financing of the FANY Mini TMB, which was greatly appreciated by all team members.